Click here to book for the workshop & book launch! On Sunday 26 May 2019, author, educator and musician, Deborah Smith will take you through a range of activities designed to teach you how to analyse music for VCE Music Performance. 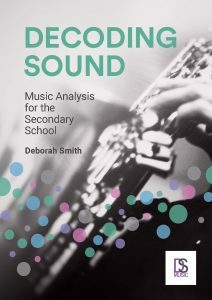 This workshop will be based on the BRAND NEW analysis textbook: Decoding Sound: Music Analysis for the Secondary School which will be launched, and available for purchase, during this workshop. Cost: Early Bird Special $70 per student if payment is made by 11 May 2019. After this date the price is $90 per student. Teachers accompanying a class attend for free otherwise the student rate applies. No refunds apply after 11 May 2019. Cost includes book launch, morning tea and comprehensive notes.